déja prevu pour Windows mobile et maintenant pour les symbian series 60 et UIQ3 . La version beta , tres difficile à obtenir sur un site de "google groupes " , a duré plus de 6MOIS . Ainsi des applications prevues pour les bons vieux PALM Tactiles , pourront venir enrichir la logitech de ces smartphones , c’est à dire des centaines de nouvelles applications en vue .
"" 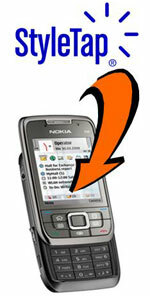 StyleTap Platform for Symbian OS is now available for download and purchase at the StyleTap website. The Symbian version supports all Nokia smartphones running S60 3rd Edition, Sony-Ericsson devices running UIQ 3.0, and the new Nokia touch UI devices running S60 5th Edition. It includes support for hardware features such as screen rotation and the optical joystick on the Samsung i8510 smartphone, and introduces a new screen rendering capability that significantly improves the readability of the screen on QVGA (240×320) devices. With this release, StyleTap-compatible applications can now run on all PalmOS devices, all Windows Mobile devices and all Symbian smartphones – more than any other type of mobile applications. See the news release for the full details.""